In an unusual twist of blogging today, this post is going to have considerably less waffle in it. That's not to say I'm not going to write two/three/maybe four paragraphs on Iceland graffiti, get sidetracked and tall about something else, constantly make reference to Harry Potter at every opportunity (I'M GOING TO SEE HARRY POTTER AND THE CURSED CHILD THIS WEEK!!!!!!!!!!!!!!!!!!!!!!!!!!!!!!!!!!!!) and use an unnecessary amount of punctuation. I'm just going to do slightly less of this than I would in my usual blog posts...because I'll be writing less...so really my writing will not improve in any way, shape or form (this is going to be a good post, I feel it). If you've been following my blog you'll know this is my third (but not last) post on our (my manfriend, Dan, and I) trip to Iceland. For parts one and two, see here (apartment tour and our visit to Reykjavik) and here (Icelandic food on any budget and the best hot dogs you'll ever have). You know what parts one and two reminds me of? Harry Potter and the Cursed Child, which, I may not have mentioned, I'm going to this week (!!!!HARRY!!!! [this punctuation is getting out of hand]) with my dear friend and fellow Potter fanatic, Sophie (she also bakes alot and blogs about it over here). Anyway to quote the famous anonymous Icelander, the people of Iceland make many graffiti and it is wonderful. I love graffiti, for my high school art A level (several moons ago) my projects were covered in spray paint and stencils, that is chicken stencils...my theme was against battery farming which I took very seriously...I even got a pet chicken (Kiki) who I would sketch in the garden as she attacked our dog (she ruled the roost...apologies). Anyway I digress, I've always loved graffiti, it's publicly available, can speak powerful messages or just be for fun, I like how it fits into it's environment, how it's not permanent and most importantly it's so diverse. Graffiti isn't just a word sprayed on to the side of a building, it doesn't even need to be painted, it could be made out of tiles, stickered or even knitted. Anyway graffiti can be awesome, it can also be offensive and normally always is illegal. 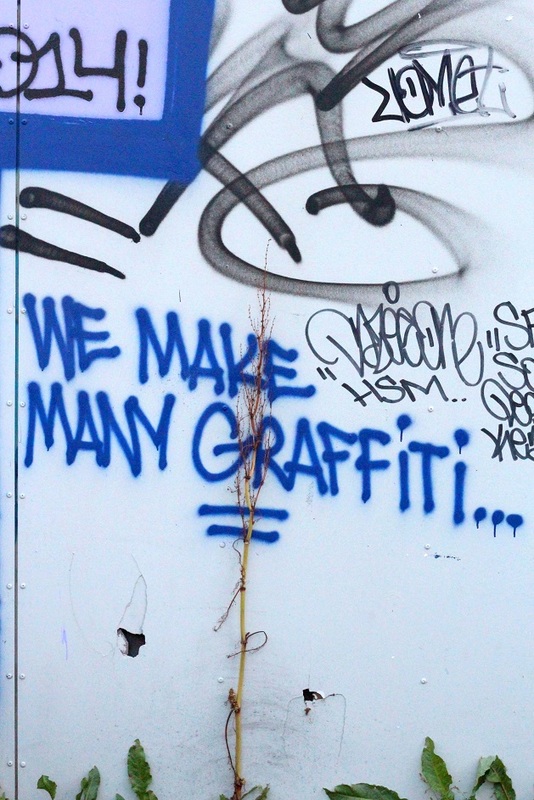 Except in Iceland, they commission graffiti artists to create art everywhere. And I mean everywhere. By the time I've finished this post, some of the graffiti that I've photographed won't be in Iceland anymore. It might have been destroyed or painted over but hey that's part of it's charm. This post is mostly photos of the graffiti I saw in Reykjavik but I'll point out a few streets/area which are definitely worth visiting if you want to hunt down the many graffiti of Iceland (as the Icelander said, they make many). The Laugavegur is the main street that runs across Reykjavik, here you'll find lots of shops and restaurants including the amazing Sandholt Bakari (those cakes! ), quite a lot of the shops have commissioned graffiti on the front and side of them, my favourite was the black, white and gold valkyrie by Caratoes,who we saw painting it when we were there in October. Parallel to this street is the Hverfisgata, this street has a lot more graffiti than the Laugavegur, but you need to keep your eyes peeled for it, it's mostly hidden round the back of buildings and car parks, the best was a series of sepia painted photos from a scrap book by Ernest Zacharevic that took up the entire side of a house, beautifully eerie, this piece really spoke to me. Down town is also an area not to be missed, there's not so much specific streets I would recommend but just walk around and make sure you look up. Deih's spaceman who's cosmos is pouring out of his face into pools of galaxies was incredible. And finally there was the road our apartment and, more importantly, Reykjavik Roasters, was on; Njálsgata. If I'm deeply honest, my favourite on our little road was the feeder pillar sprouting weeds and grass up it's front, it's simple but I liked the idea of bringing nature into such an urban object (another A level art theme). Anyway my ramble is coming to an end (stay tuned for the final paragraph...) but wherever you go in Reykjavik you're bound to see some beautiful and inspiring street art, see below for a snapshot of the ones we saw and fell in love with.